Carnival Countdown Builds Math Skills and Confidence! 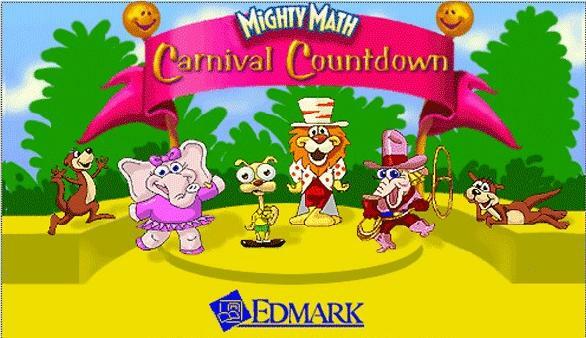 Mighty Math Carnival Countdown teaches kindergarten, 1st, and 2nd grade students the concepts, facts, and thinking skills necessary to build math confidence and develop a strong, lasting understanding of math! Entertaining activities teach addition and subtraction, place value, sorting and classifying, logic and problem solving, equalities and inequalities, basic geometry, and early multiplication and division. Learning and understanding math is fun with Carnival Countdown! Pile clowns in every direction and paint them different colors as you count and solve arithmetic expressions. Balance laughs, big and small, at the Giggle Factory, and learn the concepts of greater than, less than, and equal to. Learn about sorting, classification, and Venn Diagrams as you park bumper cars where they belong. Make bubbles go flying in ones, tens, and hundreds. Trade clusters of bubbles for one of the next larger size.